Heat the oven to 500 degrees F. Season the steak with salt and pepper. In a large skillet, sauté the onions, garlic & rosemary in the oil and butter until caramelized (25-30 minutes). Season with salt & pepper to taste. When onions are caramelized; heat a cast iron skillet with a little olive oil until nice and hot. 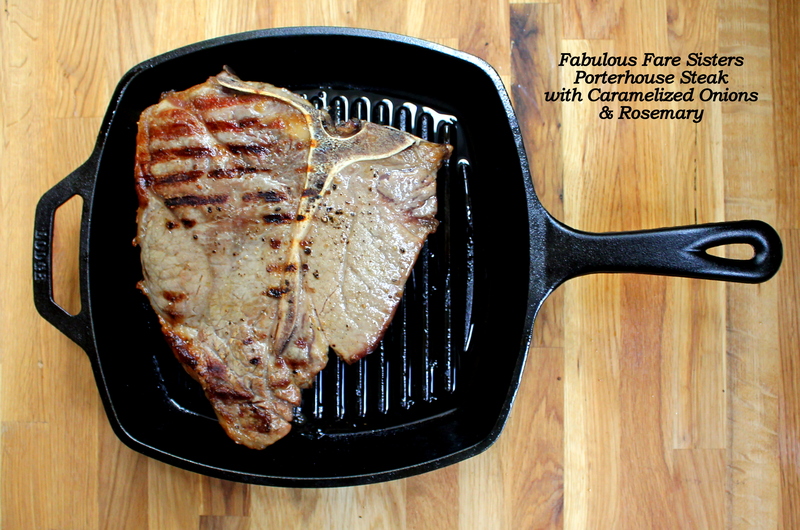 I have two cast iron skillets – for this recipe I use the cast iron grill skillet that leaves grill marks. Sear the Porterhouse steak 2 minutes on each side. Place into heated oven and roast 6-8 minutes depending on your preference for rare to medium-rare. Remove from oven and cover with aluminum foil; allow to rest for 5 minutes to redistribute the juices. Serve with the caramelized onions. I served this steak with Crispy English Potatoes and a nice salad. Enjoy! How to clean a Cast Iron Skillet – keeping it in good condition and from rusting! 1) Season your cast iron skillet with oil the first time you use it – using a paper towel, I rubbed olive oil all over the interior of the pan the very first time I used it. 3) Use a steel wool pad (for dish washing – not sanding!) and water to clean all those bits and pieces off. Rinse with water. I love onions and steak, so its a foregone conclusion 🙂 lol thank you!! The fresh Rosemary must add such wonderful flavor! It looks delicious! Thank you for the tip on how to keep, and care for a cast iron grill/skillet! I’m going to add one to my wish list! I don’t cook much these days to be honest, but if I start again a cast iron skillet will be at the top of my list! If Big Baby Boy was still little and at home I would buy one tomorrow. Alas, he’s all grown up and living hundreds of miles from home now-a-days. I only see him a few times a year. I usually am able to cook one of his favorite meals while he’s home though. I count my blessings! One is better than none! 🙂 Linda, I had babies to have babies. I wasn’t prepared for them to grow up and leave me! Heavy sigh. Oh yum! Those caramelized onions sound perfect for that steak! This looks so juicy. Well done. The tip for cleaning the cast iron is so helpful.